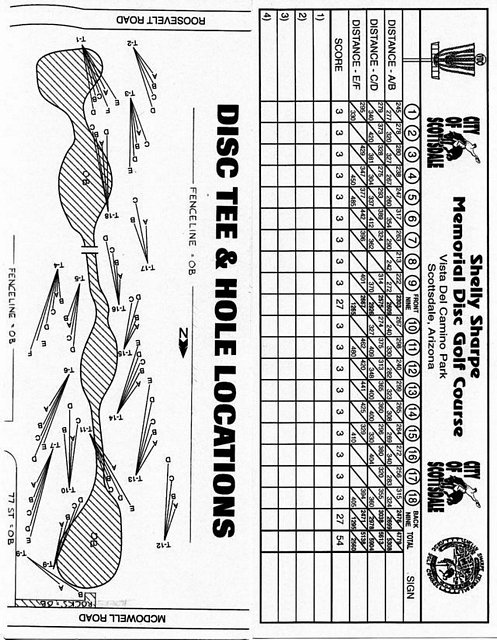 The Shelly Sharpe Memorial Disc Golf Course at Vista del Camino was installed in 1984 and redesigned in 1997 by PDGA Hall of Fame member Dan Ginnelly. It is a pretty level and open course - water comes into play on 4 holes so having a disc retriever can be helpful. Pro Shop off Hole #12 and a restaurant and hotels right off the course help make this a great disc golf vacation spot! A largely disc golf cart friendly course, although you may need to pick up your cart on a couple of rocky holes. From Sky Harbor Airport: East on Loop 202 to Scottsdale Rd. North To Roosevelt. East about a half mile through Miller. 1st tee on north side just past apartments and east of small parking lot. From East Valley: Hwy 60 to Scottsdale Loop 101. North to Mckellips Rd. West to Hayden. North to Roosevelt. East to just past bike path. 1st tee just east of small parking lot. Pretty open course with a few water hazards. Trees pose minor obstacles. If the chains are set at the long distance, it's a much more challenging course, but ends up being a grip-it-and-rip-it fest. I met Paul Ulibarri here one evening while he was practicing his putting. Super nice guy. Nice grass course, but lacking obstacles and elevation changes that would give this one a 5. By far one of my favorite courses. For a groomed course it offers medium challenges for advanced players and for beginners, you'll have nice opened spaces to practice without banging every tree like a forest course. Other park users rarely get in the way unless your playing on a holiday like the 4th of July, when the clueless masses try and use the baskets as BBQ's. Plenty of space to include your dog(s) on a leash, with waste bags available along the course. Many people start at the north end on hole 12, so when you finish you can enjoy some refreshment at Duke's or head into Spinners to shop to your disc golf hearts content. This is a great course if you like short par threes. The factor of three lakes is a great addition, especially in Arizona. Don't worry if you lose your discs in the water, the pro shops go and fish discs out approximately three times a week. The grass is also well taken care of and there is a minimal amount of trees. On the twelve hole there is a pro shop up the hill. Their website is http://www.spinnersdiscgolf.com/index.html. They also have a link for the lost discs, which is http://www.spinnersdiscgolf.com/f/Lost_and_Found1.pdf.